We’ve established that I’m a giant scaredy cat, right? I am – I can’t watch most horror films. I’m fine with blood and gore, even if I don’t really like those films. But anything where a ghost reaches out of a mirror, or a zombie clone sticks a pair of scissors in her ear, I’m out. Sorry not sorry. I did watch – and love – Jordan Peele’s Get Out. I thought it was brilliant, and the “scares” in that film were mostly intellectual and thought-provoking. While I know Get Out was characterized as horror, I found it to be more of a suspense-drama-comedy. Since Get Out, Jordan Peele has been hard at work on a variety of projects, as an actor (and voice actor) and producer. He produced BlacKkKlansman, did you know that? He’s also producing a docu-series on Lorena Bobbitt AND he’s rebooting The Twilight Zone. But many were wondering about his secretive directorial follow-up to Get Out. We knew the film was called Us. We knew Lupita Nyong’o was involved. But no one knew the plot or what any of it was about. Well, the trailer dropped on Christmas Day. And I’m out, just FYI. 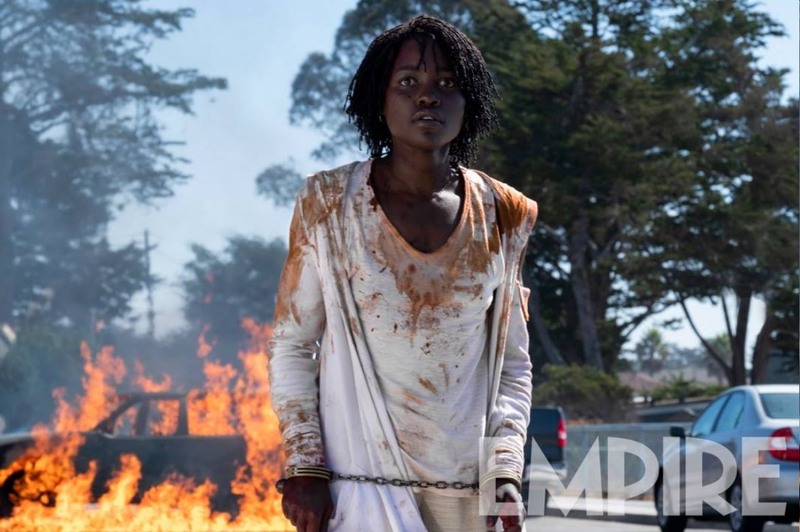 What I love is that Jordan Peele is such a horror-intellectual – he loves old-fashioned scares and gore and all of that, but mostly he gets off on finding new ways to be unsettling, to make audiences uncomfortable on a lot of different levels. That’s what will happen here – Us looks bloodier and more traditional-horror than Get Out. But I’m positive it will have uncomfortable themes about race and family too. That being said, I’m still out. I will have nightmares for months if I see this movie. Posters courtesy of ‘Us’ and additional photos courtesy of Empire, EW.